Getting a good night’s sleep is not always a matter of going to bed on time to get enough hours of sleep. Sometimes there are external factors that will affect your sleep as well. If you have roommates, thing apartment walls, or a partner sleeping with you than you might be dealing with a snorer. What’s the best way to get your rest when you’re trying to block out snoring? A white noise machine makes for a great compromise. Instead of going and sleeping in the other room or elbowing your partner every few minutes, you will both get to sleep more soundly without any hassle. How Does a White Noise Machine Help with Snoring? White noise machines won’t stop the snoring. What they will do is mask the sound so that it’s virtually impossible to notice it. This works with countless noisy sleep situations, such as barking dogs, daytime sleeping for shift workers, or partying neighbors, not just with snorers! You should find this to be a great solution to your problem with sleeping near a snorer, because the sounds will also help you to fall asleep more easily and stay asleep. If you’re not in the same room as the snorer, you might not even hear a peep form them all night. When they are sleeping next to you, the sound will be much quieter than it normally is. Complete silence is hard to come by in any normal situation, but snoring is one of the worst things for your sleep because of the inconsistency in the noise. A normal snorer doesn’t make a constant sound or else it might not be such a problem. Instead, they go back and forth between silence and loud, obnoxious noises with each breath. It’s not their fault they snore, but it is horrible for your sleep. White noise doesn’t make a room silent. What it does is produce an equal amount of sound on every frequency that the human ear can hear. Classic white noise sounds similar to static or the wind blowing, and it’s surprisingly effective for masking annoying noises. Your ears are always working, meaning even when you sleep you can hear sounds. White noise acts as a mask because you will be hearing sounds on every frequency at once, making a sudden additional sounds seem much quieter or unnoticeable. The entire point of using this white noise machine is to mask the sound of snoring around you. If your device doesn’t do that effectively, it is essentially worthless to you. Find a machine able to hide unpleasant sounds. It must be true white noise (or pink, brown, or red noise) and not just a pleasant nature sound. Keep in mind that some nature sounds have white noise added to the background of the sound, but not all of them. There are a few really good white noise machines with a feature that adjusts the volume of the white noise based on ambient sounds that the microphone on the machine picks up. This feature seems like it was designed with snoring in mind! If you’re dealing with a really loud snorer, you’ll absolutely want ambient noise adjustment. Make sure whatever device you get has sounds that will be soothing enough to help you sleep. There’s no use in getting a device that will block out snoring only to make you stay awake because you don’t like the noise. Look for something with good sound quality and a specific sound you like. How much space do you have to place your white noise machine? This can make or break a great purchase. Identify where you’re going to plug it in and which power source you’ll use. After that, you can find a device that fits those needs. Does your snoring partner hate white noise or soothing sleep sounds? Or, is there snoring so loud right beside your ears that you simply can’t drown it out without cranking up the volume too high? Look for a white noise machine with a built-in headphone jack. This way you’ll still be able to listen to your white noise and mask the snoring without overpowering your ears. Out of all the white noise machines on this list, Adaptive Sound Technologies is the only one that has the automatic listening feature. This feature comes from a built-in mic on the device and allows the machine to automatically adjust its volume to cover and disruptive or annoying noises that suddenly happen. Essentially, if there is a loud sound that is sudden and surprising, the machine will instantly become louder to cover it up. If you’re sleeping next to a loud snorer, that will mean more peace for you and better masking of the snores. 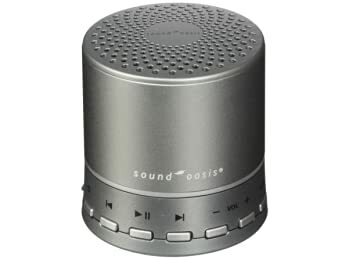 Even without that feature, this is still a great white noise machine. You get 12 “categories” of noise, from white noise to nature sounds, all of which have 4 distinct levels of richness that will add or remove layers from the sound. In this way you can customize what you’re hearing to best block out the nighttime noises that are disturbing you. You can also plug in a sound cable from a computer, MP3 player, or mobile device to play your own sounds. If all you need is some help falling asleep, you can put on a sleep timer of 30, 60, or 90 minutes and the machine will turn off afterwards. The device is capable of running on battery power from 4 AA’s instead of the USB or AC adaptor, so if you want to travel with it you won’t have any trouble searching around for a power source. There is a larger version of the same machine, but this model is a great value for your money. It’s hard to go wrong with the Adaptive Sound Technologies Sound+Sleep Mini. It’s on our list of the best sound machine for snoring because of its wide range of sounds, adjustability, and adaptive sound feature. The sound quality is also high, which helps a lot of people to sleep well while using it. When you talk about sound machines or white noise machines, this model is a classic in any conversation. It’s one of the best-selling and most popular white noise machines – and for good reason. The Marpac is known for doing one thing very well. It’s a natural white noise machine that produces its own white noise fan sound by using a fan built-in the machine. A small fan inside an acoustic chamber gives off the sound through small, adjustable slots around the top and sides. Because this is not an electronic device, it gives off better sound quality than most electric models of sound machines. The pure and unadulterated sound is perfect for masking most noises you’ll hear at night, including snoring. At the loudest setting you should be able to block out most sounds in the room and mask them to a level where you’ll be able to sleep freely. The Dohm’s size makes it easy to set on a bedside table or travel with. It’s durable and well built, with hardly any complaints ever made about it not working. You can expect to use this machine for years to make white noise in your room and hide snores from you or your partner. Natural white noise may be your best option to help drown out a snoring partner. 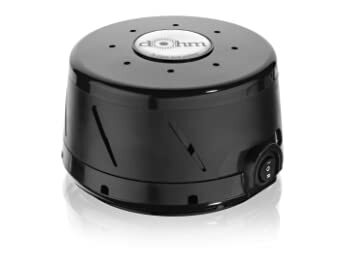 If so, I would recommend the Dohm-DS as a first choice for natural sound. It’s the best known white noise machine available and it has a reputation for working perfectly for many years without stopping. 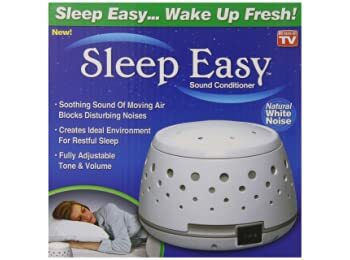 Another natural white noise machine, the Sleep Easy natural sound conditioner is similar to the above-mentioned Dohm-DS, but is better for those on a budget. It produces natural sound in the same way, but spinning a small fan inside a closed acoustic chamber with sound holes on the sides of the device. You can adjust the sound volume and tone by twisting the top cover of the device. Sleep Easy has responded to some complaints about the sound being too quiet by stating that this device is for sleeping, so the levels of sound are meant to be a bit low even at the highest volume. If you sleep next to a snorer, you will probably be able to blocking them out with this device next to you unless they are very loud and disruptive. While this machine is a bit on the quiet side, that is the one fault that is mentioned. Everything else about this device makes it a good idea for many different people who sleep next to a snoring partner and need some help to get their rest at night. This little sound machine has a surprisingly loud sound and high quality speakers. You might not except this small machine to be able to produce the kind of sound it does, but don’t judge it by its looks alone. Sound quality and volume from the Sound Oasis Bluetooth model are both excellent and will help you drown out the snorer next to you. There are 10 built-in nature sounds (including plain white noise) in the sound card within the machine. These are fairly standard noises that can help you sleep, except that they are only 8 hour long tracks and will move to the next track after 8 hours. While that can be inconvenient, you can also avoid it by using the Bluetooth capabilities and playing your own sounds instead. When using Bluetooth, this machine plays sounds very well and allows you to make your own playlist of sounds you like best, rather than restricting you to the sound included with the device. You should find the high quality of the sound and the Bluetooth noises refreshing when looking at this sound machine versus others available. It’s a small enough device to fit easily in your room and is great for travel. 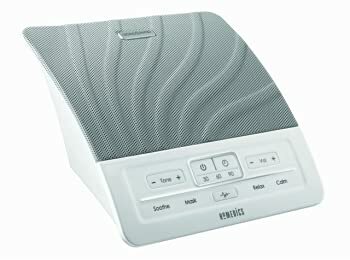 Homedics HDS-1000 is a more advanced sound therapy machine than many of the others on this list. It has 4 pre-programmed settings useful for different situations. The “relax” mode is perfect for blocking out snorers so that you can get your rest. Other settings are useful in different situations, but can also be used for snoring if you wish to try them. You can travel with this unit, as it can be run by 4 AA’s or the AC power adaptor. Use the built-in timer to set a time for it to automatically turn off if you wish. 30, 60, or 90 minutes can be set on the timer according to what you might need to fall asleep. It can also play continuously if you press the power button twice when turning it on. The shape and design of this machine are unique and will look great in your room. You will also be able to fit it onto almost any table space available without trouble, because it’s relatively small and compact. Many different types of sleepers can use this white noise machine and get the benefits from it. Anyone sleep next to a snorer can really notice the difference if you use a Homedics versus a knockoff or low quality device. 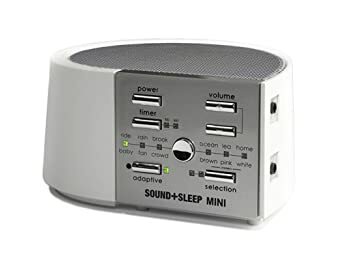 Out of the 5 models listed about, the Adaptive Sound Technologies Sound+Sleep Mini is the clear winner as the best white noise machine for snoring. It’s ability to hear loud sounds with the microphone and adjust the sound within 1/10th of a second is irreplaceable when you are trying to sleep next to a loud snorer. Sudden grunts, coughs, throat clearing, or abnormally loud snores won’t disturb you, because the device will compensate for the sudden volume increase. This makes it superior to the other devices if you need thee best white noise machine for snoring!